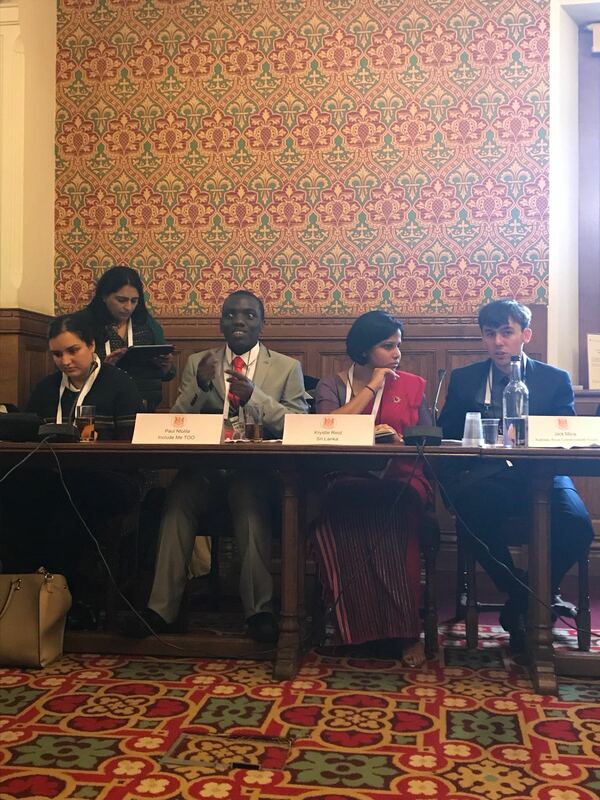 Last week, our MSc Diplomacy, Statecraft and Foreign Policy student, Paul Ntulila, attended the biennial Commonwealth Youth Forum. Read Paul’s reflection on the event. It’s fair to say, the event was the best experience of my life. All three days were incredible and it was a hugely significant opportunity for me. To be able to go to such a large, high profile international event was a privilege, the scale of which I’ve only experienced once before, at the 2012 Olympics. The significance of this event, compared with the Olympics, was the strong alignment with my passion for politics. Over the three days I met an incredible number of dignitaries and important people. On Monday morning the event was opened with a session focusing on “Powering our Common Future”. On Monday, the group heard from both the Prince of the Seychelles and HRH Prince Harry. In the afternoon delegates visited the House of Lords to share our thoughts on the Sustainable Development Goals (SGDs). On Monday evening we were treated to a patriotic reception entitled “Great” presenting the very best that Britain has to offer. Food, drink, entertainment and service were all outstanding. There were also a number of significant British trophies on display for delegates to see, such as the English Premiership Trophy. The venue was huge but it was filled with excited delegates networking all night, inspired by the offerings of event. HRH Prince William was even in attendance. Tuesday morning began with speeches from a number of important speakers, including Theresa May, but most impressive in my mind were the speeches of Bill Gates, and Andrew Holmes, the PM of Jamaica. The PM of Jamaica’s speech was powerful and I was struck by his bravery, not shying away from difficult issues relating to Britain’s history with his country. The next session of the day focused on Climate Change during which the first female PM of New Zealand, Helen Clark who was in office 1997- 2008, spoke on the impact of Climate Change while drawing upon her experience of working in the UN. 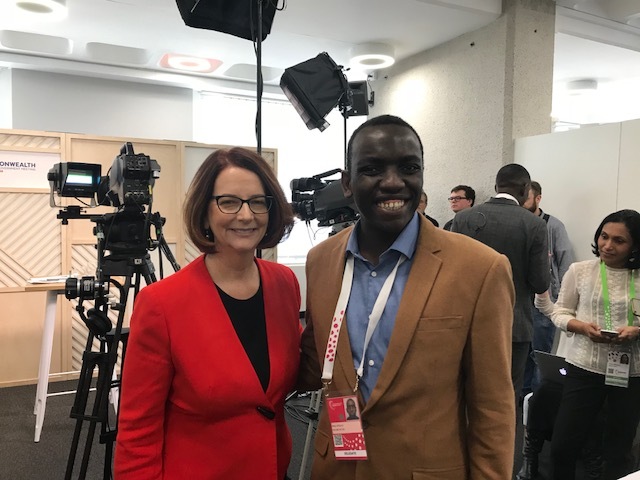 After this session I had the opportunity to meet both Helen Clark and the first female PM of Australia, Julia Gillard (in office 2010-2013). Julia Gillard was speaking in a session on women’s issues but I wasn’t able to attend. On Tuesday afternoon I also saw both HRH Prince Charles and HRH Camilla Duchess of Cornwall. Wednesday was largely taken up by youth delegate discussion groups although I did see Meghan Markle and HRH Prince Harry. They were talking to a number of delegates at the event and, while I didn’t speak to them on this occasion, I’m sure I will get the opportunity to meet them in the near future. 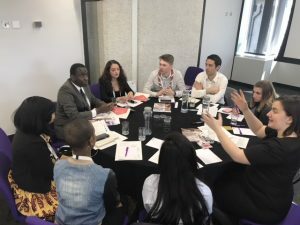 I wanted to take the opportunity to give you a taster of my incredible experience at the Commonwealth Youth Forum. The three days were emotive, challenging, inspiring and altogether an amazing experience. I don’t see myself as a Deaf person wanting to challenge injustice, I now see myself as I am. As Paul, ready to tackle important issues and work hard for the development of an improved Common Future. Thank you Paul for your insightful blog post. 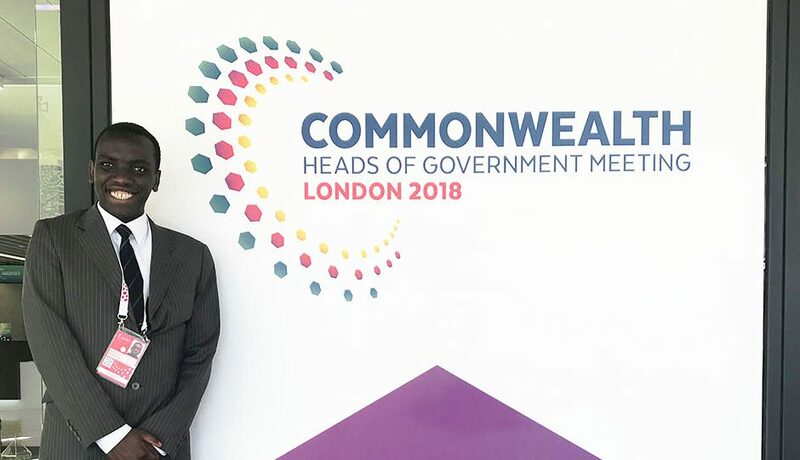 If you’d like to find out more about the Commonwealth Heads of Government Meeting, read our news article. Find out more about Paul’s story in the Loughborough University Annual review 2016/2017.